Author and journalist Lorilee Craker was just like the rest of us, feeling the pinch from the financial fallout of 2008. As a freelancer, her income was going the way of the dodo-family dollars seemed like an extinct myth, the bank account some archeological evidence of past prosperity. Then, inspired by a news segment covering the Amish and how they emerged from the economic crisis unscathed, she realized it was time to learn a thing or two about their time-tested approach to personal finances. While the middle-class was wringing its hands over the family budget and the wealthy were weeping over their slashed portfolios, the Amish were content as always, spared from the cares of the world and worldliness. They not only had financial health to support their lives, they exuded a wholeness that eludes so many when the financial bottom drops out. 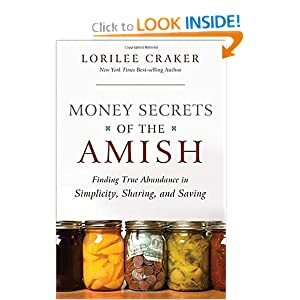 In Money Secrets of the Amish , readers go on an "Amish money makeover," learning the choices, secrets, and disciplines that safeguarded the contentment and the coffers of America's favorite plain folk by spending less, saving more, and getting happier doing it. I am always looking to save money, who isn't. This book takes this concept to the extreme and allows the reader to get a in-depth glimpse at what the Amish are all about and how they live in a frugal but smart way. What was nice about this book was that the author immersed herself in the culture and did not write from afar, but instead interviewed many Amish about their ways and this is what she is bringing to the world through her writing. The Amish have always been something of a mystery to me. I have seen them on the road, in stores or at other public locations in my years traveling and living in different places, but I have really not interacted with any of them. This book opened my eyes to the way they live and provided me (and you in the future) with some great ideas to save money and live within your means. If you are looking for ways to to cut costs, and live simpler this book is a must read!